Daily Illuminator: The Eight Day Holiday Giveaway On Facebook! December 14, 2017: The Eight Day Holiday Giveaway On Facebook! With Christmas right around the corner and holiday shopping in full swing, we're feeling the giving spirit. Eight days of it, even! 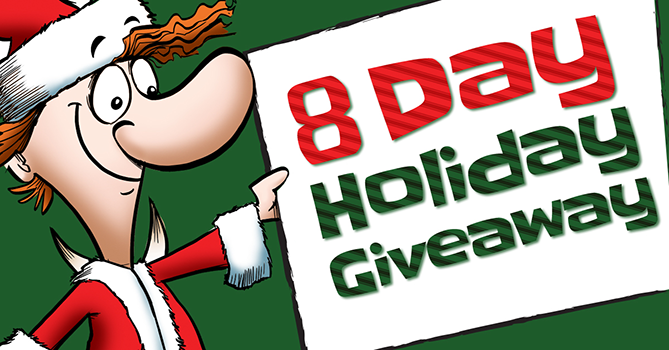 We're giving away a new prize every day during the Eight Day Holiday Giveaway on Facebook! We've already given away our furry friends Simon's Cat Card Game and Super Kitty Bug Slap, and if you're quick enough, you can enter to win a Munchkin holiday prize pack! The rules are simple: Like our page, React to the post, and follow the instruction on what comment to leave, before the contest end time. See the individual contest posts for detailed rules. Make sure you check the page daily for more contests; we've still got five more to go! And if you happen to catch the giving spirit this holiday season, make sure to check out the Munchkin Gift Pack, available at local game stores now. It's got three games wrapped up and ready for the tree!